Between being sick for the second half of February and this whole no spend month thing for some reason February felt like the longest month of the year instead of the shortest. Even with that feeling Kevin and I are really proud of how we did on our first go round of a no spend month! We started off the month a little skeptical and thinking it would be really hard for us. The bad habit of eating out or grabbing food to bring home had infiltrated our life more than we had wanted. Looking at how we did in this area there was only one actual not planned for spend this month. It actually happened yesterday and I was the guilty party. I had been eating kinda poorly over the weekend and when that happens I just crave the Corner Bakery Harvest Salad to help me reset and do a sort of IV of nutrients. Other than that one slip up we did really well on eating at home or not actually paying for the meal (thanks mom!!) for the entire month. We did end up using the $20 I set aside at the beginning of the month but didn't actually go over by some miracle. Our other spending was on point as well for most of the month. I'm still working on finding a good pair of flats unfortunately none of the ones I ordered have worked. Noticed today that the pair I usually wear has been worn down through the padding in one part eek!! I still have a lot of Nordstrom and some Shopbop gift cards so I was able to get some good shopping in without spending over the gift card. You should have seen my coupon code use and sale shopping, they were things of beauty. Unfortunately I had a bit of an NY&Co slip up. I went in thinking that I had $20 in rewards, $20 gift card and $30 merchandise credit well that was not actually the case. By the time I was actually paying and found out the merchandise credit was only $5 the associate was not the most pleasant and the line behind me was pilling up. I did end up just finishing the purchase but my plan is to go back when I return a few things to Nordstrom and return the item that put me over the gift card and rewards. I wanted to have her re-ring everything up but didn't want to hold up the line anymore than I was already doing so. Other than those little issues we stuck to our plan and our gift cards! Kevin and I are going to keep working hard to not eat out as much. I'm thinking maybe we should make an official night/meal that we splurge on and eat out/bring food in but we haven't sat down and talked about it yet. 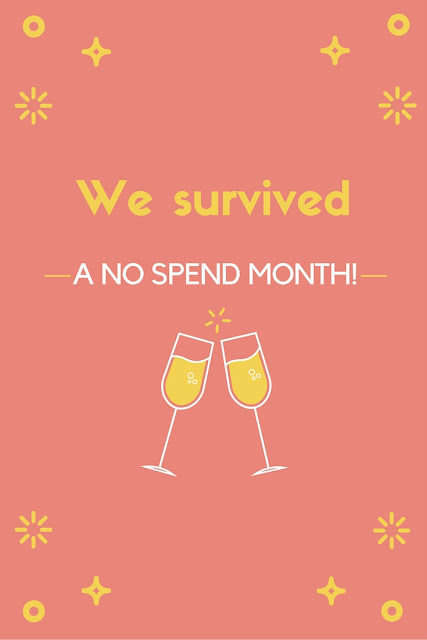 Now that we both know we can make it through an entire no spend month we're primed for the next time we do it!